Hello ~ Thanks for finding us! My name is Patti and I am the voice behind the blog. That’s me on the Camino de Santiago – 2015. My husband, Abi, and I currently have a home base in the state of Maryland. You can read more about our story on our About Us page. In 2014 we retired, a bit on the early side, to live a simpler life and to travel the world. By sharing our journey, we hope to inspire others to redefine retirement. Boomer-aged travel is on the rise and we are excited to be a part of the growing trend! Seventy-six.four (76.4) million boomers have either stepped into retirement with both feet, or they’re gearing up to retire. We’re exploring the phenomenon of how many of us are turning away from the culture of traditional retirement and redefining our path. You can learn more about this trend on our Redefining Retirement page, by clicking here. Exploring the covered bridges of Vermont. 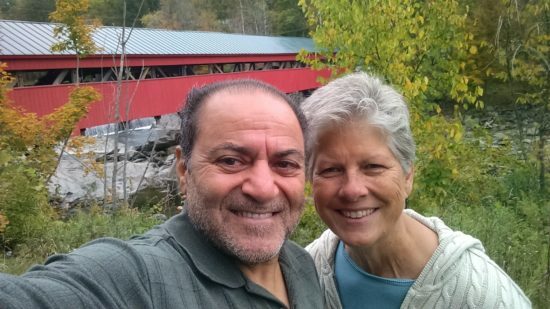 We’ve been traveling through life together for 40+ years embracing each new chapter and each new adventure with open minds. Our travels have taken us to 4 continents – North America, Europe, Australia and Asia – and to date we’ve traveled to 19 countries. Australia, Austria, Belgium, Canada, Croatia, Czech Republic, Dominican Republic, England, France, Germany, Hungary, Iran, Mexico, New Zealand, Portugal, Slovenia, Spain, Switzerland and The Netherlands. 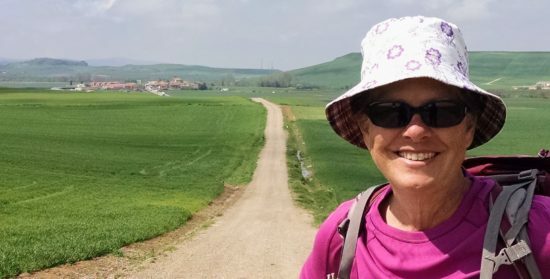 We also walked across Spain in 2015 following the Camino de Santiago, which was by far the most challenging – both mentally and physically – travel experience to date, but it was also all kinds of fabulous. There are so many more destinations awaiting us. We feel as if we’ve just scratched the European surface. Portugal is one of our favorite countries, so much so that we lived in Porto for 3 months in 2017 and we maintain temporary residency in Portugal. We divide our time between our home base in the US with our expat life in Portugal. We’ve driven across the United States a total of 4 times and each time we gleaned a great deal of insight. The US is massive and there are a multitude of dialects, cultures and beliefs to experience as one travels from state to state. To date, we’ve traveled to 47 of the 50 states. We really need to get to those elusive 3 states, Alaska, Maine and North Dakota. As a writer I look for the personal voice to share with our readers; the human interest side of the story with equal parts of humor and heart. One Road at a Time has been in business for 6 years and we believe we’ve got our fingers on the pulse of the boomer generation. And, we understand how the demographic is redefining retirement. We wrote this in the sands of White Sands National Park, New Mexico in 2014. I wonder if it’s still there. Our site offers readers a variety of content including classic road trips, adventures abroad, travel tips, the latest trends in retirement and hospitality intrigue. From time to time we share the voices and highlight the travels and/or work of others in the travel and hospitality industry. And, at times we share travel friendly sites for informational purposes such as a travel cash exchange guide. Here are a few posts to help you get started. Paris – Is it Just Another City? We love hearing from our readers and we respond to every comment received on our site and Facebook page. To follow along as we travel One Road at a Time, we invite you to like our Facebook page, follow us on Pinterest, Twitter and Instagram and/or subscribe by email to receive updates. I love Ashland. I was only there once during the Oregon Shakespeare. What a great event and beautiful location. That’s great that you’ve been to Ashland, so you know of what I speak. The OSF season is well under way and off to a great start for the 2013 season. If you find yourself in Ashland again, please stop by and say hello. Thanks for reading, Rosemarie! Hello Naomi! Thanks so much for finding us, it’s good to hear from you! I’m looking forward to following your adventures. We also do a lot of traveling outside the US and Canada now that we’re retired. 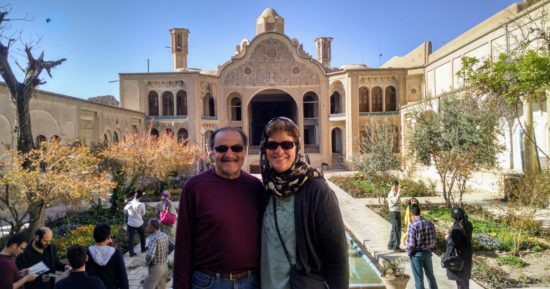 I especially appreciated your comments about Iran as I visited briefly in 1970 while traveling overland from Greece to India and also lived there from 1975 – 1977 – both wonderful experiences (mostly ). Hello Steve, thanks for finding us! I’m heading over now to check out Bergersadventures4! Thanks for sharing your travel! Looking forward to reading more. Hi Abi and Patti – It is a pleasure to meet you here. I was recently referred to your site by Suzanne (Picture Retirement). My husband and I have completed three Caminos (Tui, Portugal to Santiago de Compostela; St. Jean Pied de Port to Najera; Najera to Santiago/Muxia/Finisterre). We are currently preparing for the Via Francigena where we will be walking 400 km from Lucca to Rome this Spring. Hello ~ Thank you for the introduction, it’s nice to connect. Our dearest friends walked the Via F from Switzerland to Rome, just this past October and they loved it. We start walking on Wednesday and we’ll walk from Porto to Santiago. Once upon again I’ll head over to your site to say hello! Bom Caminho!